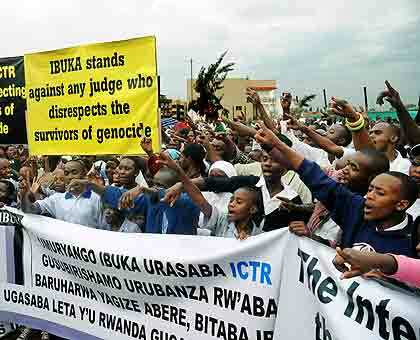 IBUKA, the national umbrella association of 15 survivor’s organisations in Rwanda, in partnership with Survivors Fund (SURF) and REDRESS, have submitted a discussion paper to the President of the Republic of Rwanda which sets out recommendations for reparation for survivors of the 1994 genocide against Tutsi. The discussion paper explores four potential mechanisms that could be used to deliver comprehensive reparations for survivors, in the form of rehabilitation, restitution and compensation for both moral and material damage they suffered during the genocide. – The types of harm suffered by survivors. – Registering past awards of compensation and restitution made by national courts and Gacaca that have yet to be enforced. – Assessing the needs and perspectives of survivors in regards to reparation. The TFRR could thereby assist in developing a consensus among stakeholders and determine the way forward in providing reparation to survivors through the establishment of a reparation program. Survivors Fund (SURF) and our partner organisations recognise and commend the efforts of the Government of Rwanda to provide assistance to survivors and hold perpetrators accountable for their crimes over the past 18 years. Establishing an adequate reparation programme would be a critical step in the government’s determination to secure restorative justice for survivors of the 1994 Genocide. Such a program could also contribute to further reconciliation between survivors and perpetrators, for whom the issue of reparation is a continuing point of contention, as long as it remains unaddressed. We recognize the many challenges and complexities that surround the issue of reparation. We hope that the discussion paper will serve as a starting point in honoring the rights and needs of survivors to reparation. 2014 is the twentieth anniversary of the genocide, and will mark the closure of the UN International Criminal Tribunal for Rwanda (ICTR). This presents a unique opportunity to deliver reparation to survivors of the genocide against the Tutsi in Rwanda for which the Government of Rwanda does not have the resources, and that the ICTR does not have the mandate. Through the establishment of an International Trust Fund for the Survivors of the Genocide in Rwanda (the “Fund”), a vehicle will be created to collect and deliver collective reparation to survivors channelled through survivor’s organisations in Rwanda. The structure for the Fund (as visualised here) ensures an inclusive approach in the decision-making, management and monitoring of programmes set up through the funding raised. Once funding is available, registered local survivor’s organisations will be invited to apply for funding from the Secretariat for specific projects in accordance with the priorities and eligibility criteria determined by the Board of Trustees in consultation with the Government of Rwanda and international donors. One of the most potential sources of Funding is the assets of genocide convicts and fugitives in Rwanda and abroad including Kabuga assets located in Kenya now confiscated by the ICTR. Survivors will be represented by local survivor’s organisations, such as IBUKA and AVEGA, as a majority on the Board of Trustees. 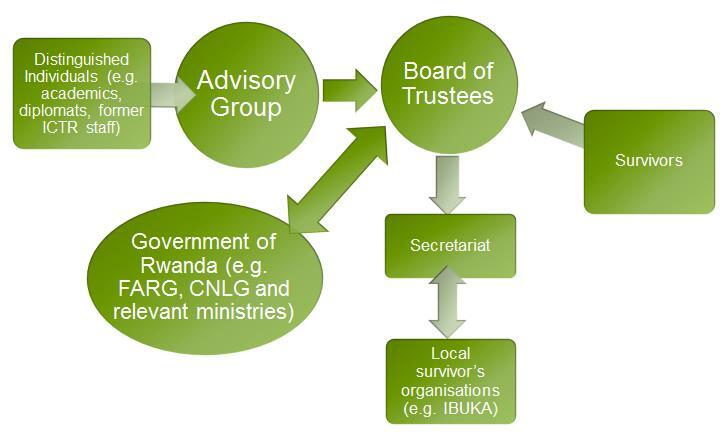 This will ensure that all survivors are effectively represented at the decision-making level of the organisation, as well as ensuring that the funding decisions are aligned with the priorities of local survivor’s organisations as well as the Government of Rwanda. The Board of Trustees will be supported by an Advisory Group composed of distinguished individuals with a specific interest and expertise in Rwanda, including academics, diplomats, ICTR judges. Members of the Advisory Group will serve as ambassadors of the Fund to help raise awareness of its work, secure funding for it and provide guidance to the Board of Trustees as required. The Secretariat will manage the operations of the Fund. This will include administering and verifying all contributions from donors, disbursing funds in accordance with the decisions of the Board of Trustees, and monitoring, evaluating and reporting on all projects funded. The Secretariat will thus serve as the intermediary between the Board of Trustees and beneficiaries. Its appointment will be put out to tender by the Board of Trustees to solicit proposals from organisations which have the capacity, experience and expertise to play this critical role. Voluntary contributions will be accepted by the Fund from any source: including international institutions, national governments and development agencies – as long as they are in accordance with the objectives of the Fund. The fundraising will be led by the Board of Trustees, in consultation with the Advisory Board and the Government of Rwanda, and will be executed by the Secretariat. There will be a need to minimise the bureaucracy and administration of the Fund, as well as ensure an effective and transparent process of disbursement of the funding. Despite the many challenges, the concept was discussed and ultimately endorsed by representatives of survivor’s organisations including AVEGA and AERG during two workshops led by IBUKA in Kigali on March 2012. The next steps in establishing the Fund will be to engage with potential partners and donors, such as UN agencies and INGOs. A working paper has been drafted and will be published on the nineteenth anniversary of the genocide, the national theme of the commemoration being kwigira (self-reliance). More than anyone, survivors of the genocide want the opportunity to be self-reliant and to rebuild their lives which were decimated during the genocide. To do so, and restore themselves to the position that they enjoyed prior to the genocide, survivors require the resources. The Fund will be the vehicle that will provide those resources through the funding of programmes which will foster self-reliance through local survivor’s organisations in Rwanda. April 2013: To secure the commitment of Government of Rwanda to endorse the call for the Fund at the UN Security Council (UNSC), first in April 2013, then in August 2014. May 2013: To develop and build a Coalition for the Fund of other INGOs, including as well supporters from across the diaspora community of survivors. July 2013: To establish formally the Fund accounting for recommendations received from submissions called for through this discussion paper. December 2013: To secure the commitment of other national governments to support the call of the Government of Rwanda to establish and finance the Fund at the UNSC. By April 2014: To secure endorsement for the call for the Fund from the ICTR to address the lack of the restorative justice mandate of the ICTR. By April 2014: To pursue the recommendations of this discussion paper to set up the governance and management of the Fund. By September 2014: To secure funding from UN agencies and programmes, as well as the international community, as contributions to the work of the Fund. 10. By December 2014: To begin the disbursement of funding of the Fund to programmes to support survivors of the genocide in Rwanda. Though by no means inflexible, this begins to set out a roadmap for the work ahead to establish the Fund. Though there may be many challenges ahead in doing so, we believe that the will and commitment is present amongst all critical stakeholders to ensure that the goal of restorative justice for survivors of the genocide against the Tutsi is realised.